This entry was posted in Recent Posts and tagged Colorado, Fight, Free Range, Haiku, Inner Voice, Look Away, mental health, Mules, Pain, Photography, Poet, Poetry, Reflection, Sadness, Security. Bookmark the permalink. The title is perfect for this haiku! I’ve never seen mules painted like this – I always thought they were a brown-gray, but these are so unusual. I love their markings. No wonder there’s a debate. They need to know who got into the paint closet. One thing has changed. it is a new day. Fitting piece of work ma’am. FWIW: At a glance, they appear well fed with average Body Condition. Thank you. C. Good to see you. I concur. Has me thinking they are a few folks’ favorites up there by Twin Lakes. Who wouldn’t want to see them stop by? Ever read “Family Cirus”? Remember “Ida Know”? Family Circus was my favorite comic growing up. I sought after it in every newspaper. Thanks for the giggle. Nada Me, I wanted to see Beetle Bailey being himself. Yes, a great one, as well. I remember as a teenager the Far Side comic inspired many a giggle as I let the boys in my homeroom class try and explain the comic’s intended joke. Little did they know I understood perfectly. Just enjoyed watching them smile. I do love your “e-vile” ma’am. Guess who has the nice big two volume in slipcase Far Side collection? Girly-girl and I peruse it periodically. Neat to watch as she gets more jokes each time. We also have all of the Calvin and Hobbs books. Go figure right? This makes me smile, C. Such a great comic. Go figure, indeed. Glad you had a smile ma’am. I love the picture, Audrey. “Nothing has changed” seems to apply to too many things these days. It makes my head hurt a little. I hope you’re starting a great week. I know, Dan. Rough start to the week already, and all over this country. Many hurting. Much love to you. My week has been productive already. This is always a good thing. Hope you’ve been well. Except for a network issue that is keeping at work, I’m good. It has been a tough week for a lot of people. Ugh. I play IT at work. Most days I cross my fingers and hit up Google for an answer. Good luck! Aw, the poor dears. What are they finding to eat out there? Things look a bit dry, I think. By the way, which one won?? Hi, Debbie. 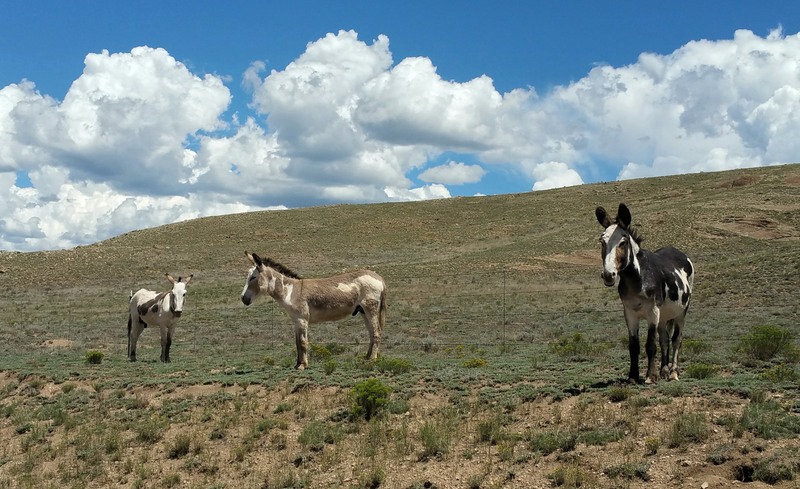 There’s a number of wild mules/donkeys in the Rockies. I thought the same thing as you…what could they be eating, but they find plenty my dad says. Who won.. good question. Smiles. My bet’s on the one at the far right. He’s giving you a look that asks, “What?”!! Or a “I’m better over here alone” face. Smiles.